When a crowd of Portland whale enthusiasts wait to catch of glimpse of these majestic animals, they aren't disappointed. A mother southern right whale and her calf make a stunning appearance, splashing in and out of the water as though they want to be seen. This isn't an uncommon occurrence in Portland, where whale watching is a popular activity year-round. Southern right whales don't have a dorsal fin like most other whales. What they do have are callosities. These are large areas of calloused skin that present as white bumps around the whale's head. Only three species of right whale carry this distinguishing feature. Interestingly, the callouses themselves are gray but appear white due to whale lice, barnacles and other harmless attachments. Southern right whales saw their numbers dwindle from roughly 100,000 to only 12,000 as a result of whaling, according to the Wild About Whales conservation group. Luckily for the whales, and for us, the southern right whale is making a huge comeback. Their population is estimated to be increasing at about 7 percent each year. 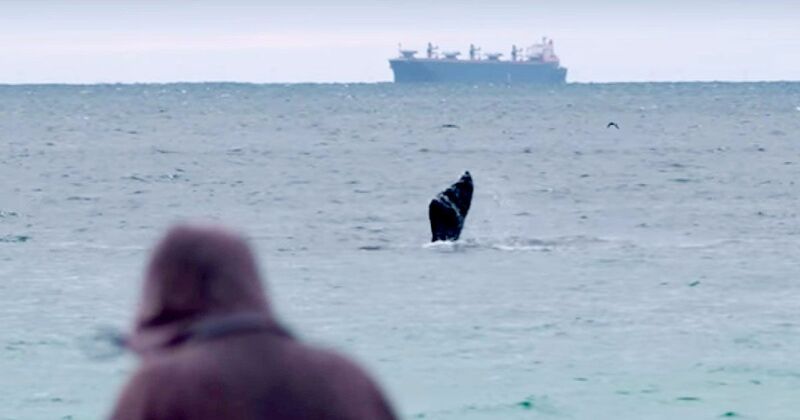 As a result, we are likely to see the southern right whales more often. We are also going to be seeing more of their adorable calves. Southern right whales begin reproduction around age 10 and birth a new calf every three to four years. They are believed to live around 50 to 100 years, according to Whale Facts. That's a lot of years to live and a lot of calves to birth! It's no wonder the species is on the rise.